Description: Town Hall and shops. 1883 by Absolm M. Wood in Neo-Renaissance style. Ashlar faced with plain tiled roofs with ridge cresting. Town Hall and shops. 1883 by Absolm M. Wood in Neo-Renaissance style. Ashlar faced with plain tiled roofs with ridge cresting. Main range of 2 storeys and 5 bays, the central bay advanced. Channelled ashlar to ground floor with shallow arches over shop fronts (some altered), and central doorway with paired console brackets carrying balcony over. Upper section divided by brick pilasters, the windows have stone moulded mullions and transoms with rounded arched heads. Terracotta balustrading and frieze, stone pediments over outer bays, with heavy console brackets. In the entablature are inscribed: "Peace, Happiness, Truth, Justice AD MDCCCLXXXV". Over the central bay, a raised double pediment, the lower section raised on Mannerist urn-like pilasters, and cut by a higher segmental pediment. Recessed outer sections of 2 bays with paired lights in ashlar lower storey and oriel bay windows over with foliate swags and steep pediments with Mannerist decoration. Brick parapet eaves cornice with stone dressings. Similar decorative detailing carried round return to Butterfield Place. Interior has central single flight and two flight return stone staircase with a 3-light boarded window. Central hall has coved plaster ceiling hidden behind 20th Century flat false ceiling and fluted pilasters with composite capitals, east and west galleries with elaborate iron balustrades. Former courtroom and council chamber retain their plaster ceilings and doorcases. 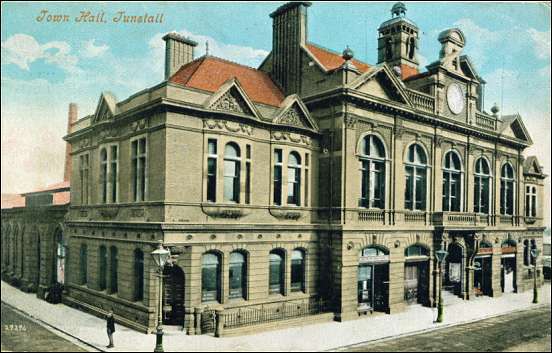 The building was formerly the Town Hall of Tunstall, one of the six towns federated together in 1910 to form the City of Stoke-on-Trent.